I was sent this line by Influenster for review purposes. I have an obsession with hair products so was immediately overjoyed about receiving this box. The Fibralogy line from L’Oreal claims to create visibly thick, voluptuous hair after 5 uses. They say that it will create visibly thicker hair over time, it doesn’t actually say it will thicken your hair, only the visible appearance. So does that mean it won’t actually thicken your hair? But just create the illusion of thicker hair? It that is the case then you’d probably have to continue using this forever for the effects to stay. I like to switch up my hair care all the time so I’m not sure that this would work for me. But I’m going to give it a go anyways. The products smell nice, like a typical good smelling shampoo I guess. I don’t know how to describe the smell, it’s pretty light. You start off by using the shampoo like normal and then after you rinse it you squeeze a dime sized amount of the thickening booster into your hands and apply it to your hair. Then without rinsing you apply the conditioner. Then you do a full rinse. I was confused as to why they just didn’t put the booster into the conditioner, but maybe it needs to act alone? Or maybe they just want us to have to buy another bottle. Either way, it would be nice if it was just mixed in with the conditioner. I took the blow dryer to my damp hair the first time using this line to see the results. I find my hair looks better and more full when I blow dry my hair as opposed to air drying. My hair felt very soft and smooth from the Fibralogy. It had quite a bit of bounce to it too. I’ve been using the Fibralogy line for two weeks now and I don’t think that my hair looks any thicker. My hair looks nice and healthy but I don’t see a difference from when I use any other line. My forehead started breaking out around the same time as using this line. I’m unsure if it’s related but it’s the only thing I changed in my routine. I haven’t figured out if it’s the cause but I’m not sure what else it could be. 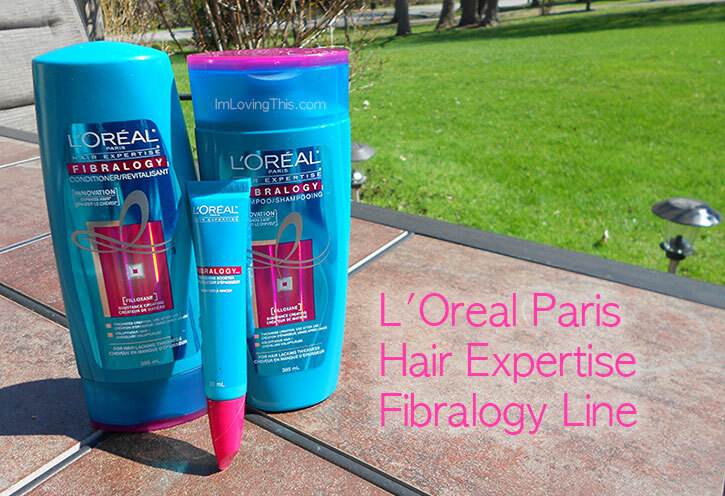 Overall, the L’Oreal Fibralogy line is nice but I probably wouldn’t repurchased it. It’s nice but not my favourite. I don’t like that I’d have to use the serum every time I wash my hair. It’s more work and since I don’t see any difference in my hair it’s just not worth it to me. I’ve never really been impressed with any of L’Oreal’s hair care so I wasn’t surprised with my feelings towards this line. You could give it a go yourself, I’ve seen online that many other people enjoy it. Everyone’s hair is different. What’s your favourite shampoo and conditioner? If you read my blog then you know I’m a hair care junkie and love trying new products so would love any recommendations.